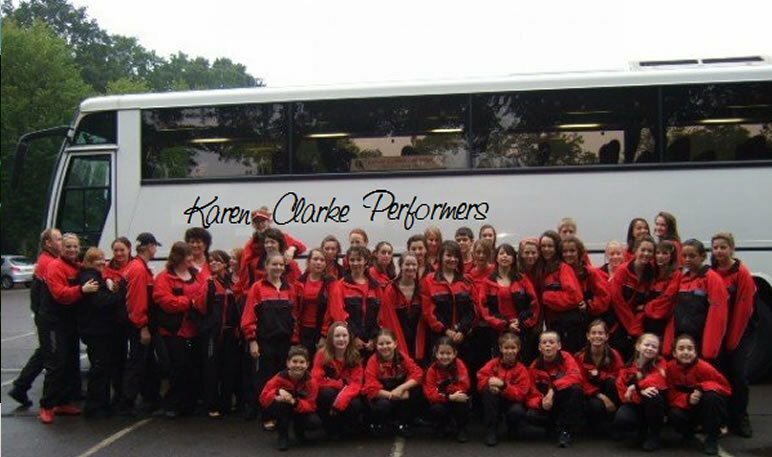 Karen Clarke Performers returned to Horsell after another successful trip to Europe last summer. Thirty One Performers and their team of technical Staff and Chaperones headed on a coach towards the coast of Spain. They hosted their first hour performance on the promenade of Malgrat de Mar. Both residents and tourists were rather intrigued by the performers appearing from the pop up dressing rooms in their spectacular costumes along with the sound system being set up in the middle of the promenade, within minutes an audience started to gather. The performance started and although the performers struggled in the 45 degree heat, the audience loved it and sent the performers on a buzz. The following days saw two further performances at Hotel Olympic Park at Lloret de Mar and Plaça de l’Ajuntament, Platja d’Aro. Staff from the venues were drawn out to watch the performances and were applauded by their professionalism and vitality and finishing with a standing ovation on both occasions. Some of the best memories were found at these displays for the performers where they received dazzling receptions with hundreds of people stopping to watch – and later wanting photos with the performers. They were treated like stars. Spain pre-empted a further successes at Disneyland Paris, where the performers are well known and are renowned for their incomparable standard of shows. The Disneyland rep welcomed the dancers as ‘Disney Artists’ when they first arrived in the back stage area. Other staff members who were passing whilst the group were warming up even commented on their professionalism and standard. Management from Disney were called to watch the shows and were keen to offer the school an open ended invitation to perform at Disneyland Paris. Karen Clarke performed over a period of two days to large audiences at their fantasy stage, and were proud to be named one of the best groups to be held at Disneyland Paris. The performers showed dedication and relentless vitality throughout the trip even though they were extremely tired after the long journey’s and busy schedules. The trip has spring boarded Karen Clarke into the next academic year, and they are getting ready for another busy term giving opportunity to young talent in the local area.